a bit of a mess this week. ✔ cooking proper dinners this week. * my tolerance for ‘cooking for one’ is only so great, and then i just plain don’t want to do it. and josh hasn’t been home before 9 once this week, i don’t think. ✔ studying. ughgh, i’m a broken record! here’s the deal: boards are in november, which sounded a loooooong way off back in january but now is . . . not. i’m a pretty good test-taker, but there is a LOT on this exam and the stakes are fairly high! not only does it cost close to $3000, but i really would not enjoy having to tell my future employers that i have to retake it. [also, it’s only offered every 2 years, so that would put me in 2015]. i can practice as ‘board eligible’, but it is much nicer to be ‘board certified’. basically, i need to create some indelible schedule that i cannot break under penalty of [something bad?] and just DOOOOOO it. ✔ focusing well at work. i am greatly looking forward to spending 2 weeks back on the wards in july — even though “wards in july” makes me shudder a little. i am just tired of thinking about my research [and avoiding thinking about my research, which is unfortunately the more accurate description of my current scenario]. i re-read the happiness project recently. because i’d found it pretty magical the first time around, and i wanted to see if it would strike me differently as a mother. plus, i remembered that gretchen rubin’s children were young in that volume, and . . . honestly, i was looking for toddler-related wisdom. there wasn’t much. however, the book was still quite engaging and made me think. i found it interesting that in the end, it seemed like gretchen stated that she got the most happiness out of simply . . . following through, or [in her words] “doing what ought to be done” to eliminate the bad from her life. clearing clutter. eating better. eliminating nagging, snapping, and gossiping. she also mentions the power that her chart had in helping her keep her resolutions, and how that in turn made her happier. i’ve been making plenty of lists right now — but i haven’t been so great about keeping up with them. and that is definitely not bringing joy to my life. i don’t know. i am not saying that i am unhappy right now — and i have so much to be thankful for!! –but i have been happier. however, i think the answer has less to do with anything gretchen has to say and more with the fact that i feel a lot of anxiety and pressure right now related to work/the move/ uncertainty up ahead. just so ready to move onward and upward!! saw this today in someone’s office! maybe she read yesterday’s post!? * before anyone calls DSS on me, i do make sure annabel has a proper meal, even if it is simple. tonight, she had scrambled eggs, whole wheat toast, peas/carrots, and milk. i had cheese, chips, and chocolate. oops. I saw a bunch of patients last week who had really crappy functional status — AND THEY WERE 50 YEARS OLD. They had terrible health, and probably were going to die in the next 5-10 years if not sooner. It really freaked me out. I really want to enjoy the process and not feel beaten down all the time. I also want to stop feeling so guilty whenever I don’t take full advantage of Pickle time — like if I choose to let my husband have 1:1 time with her and I go for a run (or take a nap) instead. 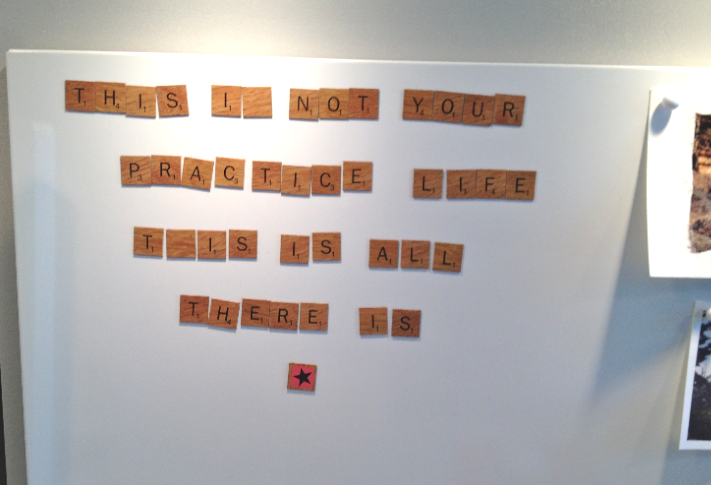 You’re right — this is not a practice life. This is it.